The effect of spruce and birch on the spatial distribution of the decomposition rate of pure cellulose in the region of the Middle Urals copper smelter near the town of Revda in Sverdlovsk oblast (southern taiga) was studied. 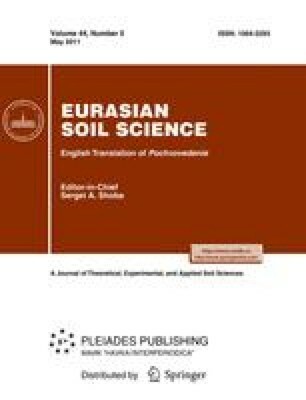 The contamination of the soil by heavy metals (Cu, Pb, Cd, and Zn) decreased the decomposition rate by 2.7 (spruce-fir forests) to 5.4 (birch forests) times and increased its spatial variation (the coefficient of variation reached 80–226%). The trees in the forests could not be considered as the main determinants of the horizontal structure of the soil microbocenosis, because the position of a test point with respect to the tree stem explains less than 10% of the total spatial variance of the cellulolytic activity. The decomposition rate of the cellulose in the spruce-fir forests was higher than in the birch forests; it was higher in the undercrown areas than in the forest canopy gaps. It was supposed that this was related to the buffering role of the litter, which smoothed the fluctuations of the water content. Under the pollution conditions, the differences between the coniferous and deciduous biotopes increased, and those between the undercrown areas and canopy gaps decreased. Original Russian Text © E.L. Vorobeichik, P.G. Pishchulin, 2011, published in Pochvovedenie, 2011, No. 5, pp. 597–610.